Are Robots the School Teachers of the Future? Have you seen the 1990-film "Class of 1999?" In it, a Seattle school system is so ridden with gang violence and drug abuse that not even the police will dare to intervene. The Department of Defense is brought on to implement a program where robot teachers, referred to as Cyborgs, are employed to educate students and provide discipline when students misbehave. With programmed tactics for corporal punishment, they have no problem maintaining control of a classroom, but as they develop into more intelligent entities, their decisions trend towards opting to kill off delinquent students. As a disclaimer, I will point out that I, in no way, recommend this movie for quality or even for entertainment. It does, however, instill appropriate fear of what can happen if we begin to rely on machines for educating students, particularly in developing areas or areas with unstable education practices. 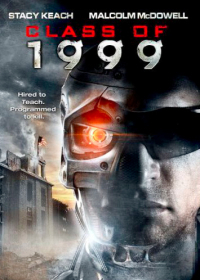 1999 was a bit of an opportunistic estimate for when robots would appear in classrooms. In the past decade, however, advancements in technology have made instruction simulation so effective that the necessity of a well-educated, high quality teacher in a classroom has been brought into question. Several benefits can even be drawn from allowing technology to dictate student education in developing countries. Relying on technology for classroom instruction creates an even playing field where all students are learning everything that needs to be covered according to curriculum standards. They are all also receiving the same high quality information. This cuts out concern for poor, unreliable, or novice teachers, a problem that unfortunately is prevalent in many developing countries. Making use of technology ensures proper assessment of students so that unbiased decisions can be made about student progression. This cuts out the worry of teachers "passing students along" rather than ensuring that they really know the material. Taking advantage of technology for student instruction can greatly cut down on teacher salary costs. By placing the burden of teaching lessons on programmed instruction, paying extra for a well-educated teacher with lots of experience becomes superfluous. There are currently plenty examples of schools in developed nations embracing this technology. Just last week I was in a classroom that made use of SMART Board technology and associated "virtual teacher" apps. The 4th grade teacher in charge of the room told me that she believed the technology would soon replace her job. 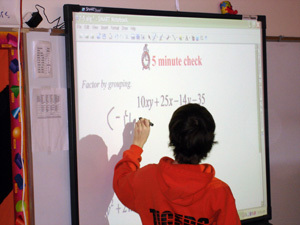 For those not acquainted with the technology, SMART Boards are interactive white boards that can project computer displays and allow students to interact with them through touch. SMART pens allow students to write on the screen, and the board is able to translate the student's handwriting into computer text and then save it as a Document file on a connected computer. Resources and applications supplied with the board feature "virtual teachers" that provide a lesson, ask students for feedback, and then advance when students give correct responses. Implementing this technology in a classroom requires existing infrastructure for electricity and Internet, an instructor device (desktop/laptop/iPad) to connect to, and software to enable the use of all aspects of the hardware. Sound a bit sophisticated for use in the developing world? SMART Technologies doesn't think so. In December of 2010, they launched the 400 Series SMART Boards, providing the technology at lower cost exclusively to schools in EMEA (Europe, Middle East and Africa), Asia Pacific, Latin America and Mexico. These schools could now purchase an interactive whiteboard and short-throw projector for $2,599. This figure does not include software, maintenance, or professional development costs. Even more outlandish, in 2009 the human-like robot teacher, Saya, was introduced to a classroom in Japan. By manipulating the rubber molding of her face, this robot was programmed to express six different emotions - surprise, fear, disgust, anger, happiness, and sadness. It could tell students to be quiet and was even reported to make children cry after reprimanding them. While not currently able to deliver classroom instruction, there is hope that by integrating this sort of "emotional" robot teacher with existing "virtual teacher" tools, this technology will change the way today's classrooms are instructed. The cost of a made-to-order robot teacher from Japan: $51,000. Let's take a moment to not even consider these higher cost technologies. More prevalent in the developing world, software is employed on low-cost laptops, desktops, or tablets to simulate teacher instruction. In these classrooms, an entire curriculum can be imparted to students through a computer program, making a quality human teacher unnecessary. So can technology replace teachers? Through evidence pointed out above, I am inclined to say yes, or eventually yes. Should technology replace teachers in the developing world? My firm and whole-hearted stance is that it should not. Think back to primary school. I bet that just about everyone reading this post can point out one teacher that was particularly inspiring. In developing countries where truancy policies are enforced to a much lesser extent, inspiring teachers are vital in encouraging kids to stay in school, rather than opting to stay at home to work and provide for the family. Expectations for students to continue education and earn a promising career are also lower in developing countries, a tendency that can only be transformed with motivational human role models within the classroom. Unfortunately, there are no inspiring robot teachers. They are all programmed to spit knowledge out at students and expect students to spit it back at them. A computer cannot develop personal distinctions between students. It cannot develop creative or innovative ideas for teaching material in a new way. It cannot comment on papers, providing students with extremely valuable positive feedback or critiques. It cannot pull a struggling student aside and determine if there are personal issues related to his/her performance. It cannot encourage students with a particular strength and interest in a subject to consider certain career paths. Many will make the claim that technology excites students in developing countries, and this makes them want to be in school and learn. While I agree that interactive technology can add a level of student interest over teacher lectures, once the novelty of technology and computer instruction wears off, students will not maintain this excitement level. Furthermore, in developing regions where a baseline for education standards and expectations has not been refined, employing technology as an alternative to human instruction makes it much more difficult to gauge design specifications for effective instructional software. Creating instructional software requires having a firm grasp on student expectations and an understanding of what motivates students of a particular background to learn. This is more intuitive in developed countries where methods for effective student instruction have been extensively researched and practiced. In developing nations, education should be viewed as more than just imparting knowledge. It is responsible for adequately preparing a student for a role in the world. While technology can be a great tool for promoting interactive learning and providing information beyond the scope of a teacher's knowledge base, it cannot replace the intrinsic value of having a human devoted to a child's educational development present in a classroom.